ASUS shows off its STRIX GeForce GTX 980 and 970 cards. The 980 has a 1178MHz core, 1279MHz Boost and 4GB GDDR5 memory clocked at 7010MHz while the 970 has a 1114MHz core, 1253MHz Boost and 7010MHz memory. 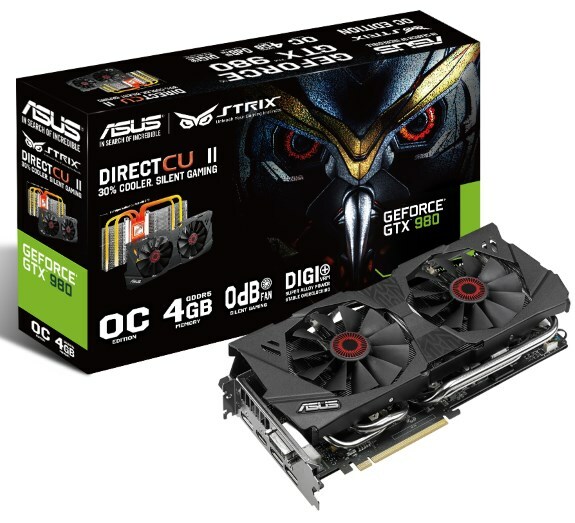 ASUS today announced Strix GTX 980 and Strix GTX 970, all-new gaming graphics cards packed with exclusive ASUS technologies, including DirectCU II for cooler, quieter and faster performance for incredible action gaming; 0dB fan technology for light gameplay in total silence; and Blu-ray movie playback that’s free from distracting background noise. The new cards feature exclusive ASUS Digi+ voltage-regulator module (VRM) technology and Super Alloy Power components for enhanced durability and cooling, and GPU Tweak for overclocking and online streaming that’s as simple as it is flexible. Both cards come equipped with a DisplayPort interface to support connections up to 4K/UHD (ultra-high definition) resolution. Strix GTX 980 and Strix GTX 970 are factory-overclocked at 1279MHz and 1253MHz respectively for better gameplay experiences. They are fitted with 4GB of high-speed GDDR5 video memory that races along at boosted speeds of up to 7010MHz. When running the 3DMark Fire Strike benchmark at 1920 x 1080 Full HD resolution, Strix GTX 980 performs 3.7% faster and Strix GTX 970 performs 7% faster than reference designs. Strix GTX 980 comes with comes with sleek red and black metallic stickers that lets gamers customize their card to give it their own unique look. Strix GTX 980 and Strix GTX 970 both come with the ASUS-exclusive DirectCU II cooling technology that outperforms reference designs with its 10mm heat pipe that transports 40% more heat away from the GPU. The design also provides 220% more heat dissipation, resulting in performance that is 30% cooler and 3X quieter than reference for incredible stability and very low noise during intense gaming sessions. Strix ups the ante even more with 0dB fan technology that lets players enjoy games like League of Legends® and StarCraft® in complete silence, due to a thermal design that is able to keep GPU temperatures below a set level, when the fan stops completely. Strix GTX 980 and Strix GTX 970 include Digi+ VRM technology. This 10-phase power design in Strix GTX 980 and 6-phase design in Strix GTX 970 uses digital voltage regulators to reduce power noise by 30%, enhance energy efficiency by 15%, widen voltage modulation tolerance, and improve overall stability and longevity by 2.5X compared to reference designs. Strix GTX 970 is designed to use a single 8-pin power connecter for clean and hassle-free cable management. Strix GTX 980 and Strix GTX 970 come with GPU Tweak, an exclusive ASUS tool that enables users to squeeze the very best performance from their graphics card. GPU Tweak provides the ability to finely control GPU speeds, voltages and video memory clock speeds in real time, so overclocking is easy and can be carried out with high confidence.